Looking for Yoga Retreat info? Click here! Going to Africa has been a bucket list item of mine for ages. And while I've technically been before (to Morocco), I've been told Morocco isn't "real Africa," so this Kenya trip made it official. 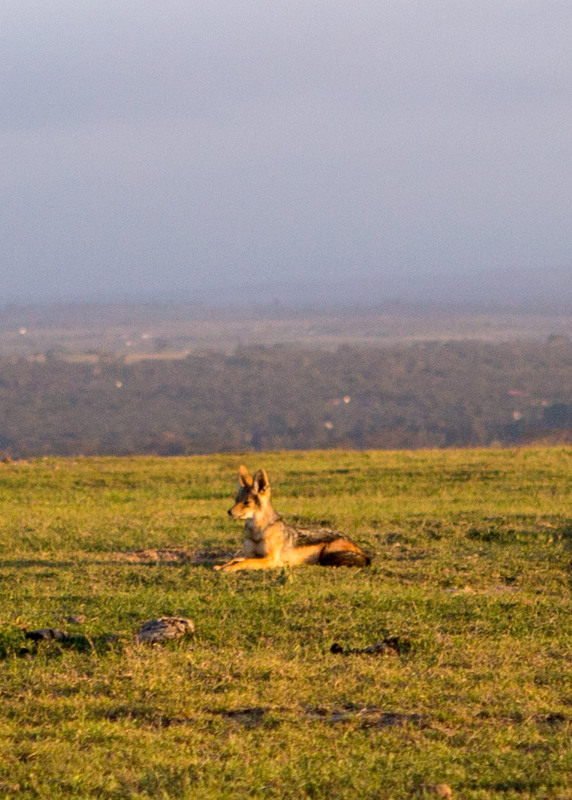 I'm thrilled to share photos and a video from our Kenya Safari Yoga Retreat a few weeks ago! So our trip actually started in Nairobi. Our group met at the hotel, spent the night, and then the next day we were off for a four hour drive to Ol Pejeta. Once we arrived, the thing that immediately struck me was just how many animals there were on the conservancy. I thought for sure we'd see one or two elephants if we looked really hard. I did not anticipate seeing elephants and zebra and gazelles and giraffe right away! The venue was right on the equator and right at the base of Mt Kenya. What this meant is that there was really no dawn or dusk light. At 6am it was pitch black, and when the sun rose at 6:05am, it was mid-day bright! Being in the mountains also meant that when the sun went down, it was pretty cold. Like, colder than I had anticipated. I should've brought a hat and glove kind of cold. And long johns. Next time. 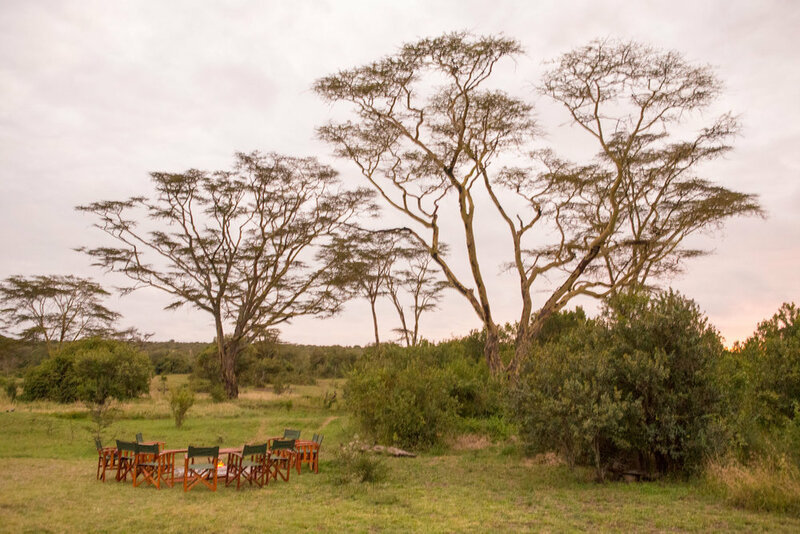 Our group stayed at The Safari Cottages in Ol Pejeta Conservancy and it was fantastic because while I'd always wanted to go to Africa, I didn't really want to rough it. I'm not much of a trooper when it comes to that sort of thing. Could I stay in a tent for a week if I had to? Yes. But would I want to? Not particularly. So when I saw the cottages at The Safari Cottages, I knew this place would be perfect. Not only did they have the basics like indoor plumbing and hot water, but they truly had all the comforts of home (a working fireplace, the most comfortable beds, a beautiful veranda overlooking the bush). The only thing I missed from home was my dog! Below you can see a little yoga video I shot on the veranda of my cottage. With the exception of a few days on which we did lion tracking or a bush walk, most of our days started with a morning game drive. We left around 5:45am and hopped in the car with our guides. The animals are most active in the early morning and early evening, so we didn't mind the early wake-up calls. The other great thing about being where we were is that we were on the far side of the conservancy, where not too many other tourists go. For the entire week, I personally only saw two other jeeps. We joked the whole week that we felt like we were in Jurassic Park only instead of dinosaurs we were seeing African wildlife. It never got old to me to see the zebra and giraffe...and any animals, really. The entire week felt like one pinch-me-moment after another. The animals are there on their own free will. While it's a rhino conservancy (rhino are poached for their horn), there are corridors along the boundaries of the conservancy where all animals (except rhino) can cross. It's sort of genius - I guess they put up barriers that all animals except for rhino can fit through. 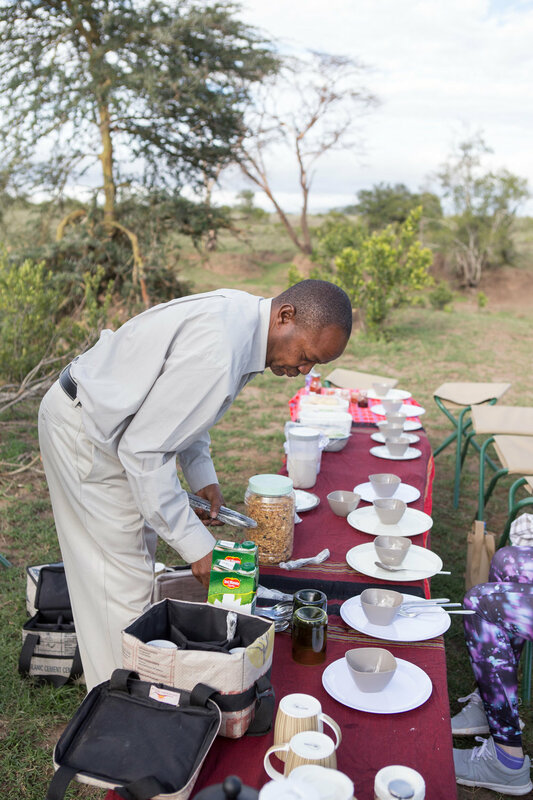 For the most part, we stayed in the cars (#safetyfirst) but we did have breakfast in the bush most days, where our guides would bring us to various locations and set up a homemade breakfast from Sonja, one of our incredible hosts from The Safari Cottages. Our guides were incredible (you can see them at the start of the video above). They're all Kenyan, and take such great pride in what they do. They're like walking encyclopedias, and can answer any question about any animal or plant you see. They truly live and breathe the game drive life. We asked one of our guides, Ben, what he did in his time off, and he said he liked to read about animals or watch National Geographic! After breakfast, we'd keep on with our game drive and slowly make our way back to the cottages for yoga. Water Buffalo are so funny looking to me. They're always mean muggin'! Look at that face! They're also super dangerous if you're out of the car. Like, the most dangerous animal. Or up there, at least. They've been known to attack humans with their horns. Yoga at the cottages was pretty special because it overlooked this watering hole where we'd often see elephants! After yoga, we had lunch and it wasn't like a little grab-a-sandwich-and-go kind of lunch, no no! Lunches would easily last two to three hours with impeccable service from the waitstaff and delicious course after course. It blew us away how much food they could create from such limited resources. The chef was cooking out of a kitchen that was no bigger than a closet. There was no way to set the temperature on the stove or the oven - it was just super hot or it was off, and they made the most incredible meals! We were all stuffed after each meal, and I probably gained five pounds that week! One thing I absolutely loved about mealtimes was that Sonja was adamant that the chef use pretty much everything he could that was served. Absolutely nothing went to waste. I just loved that. After lunch, it was time for another game drive. 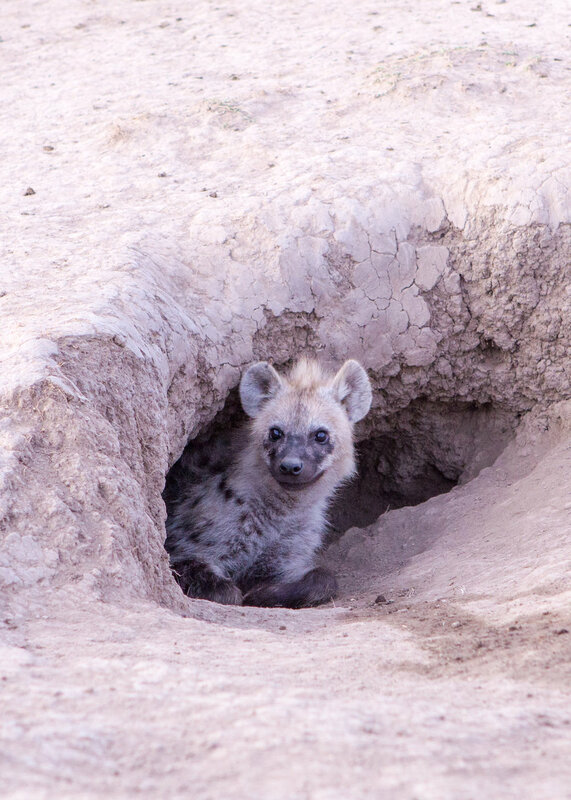 I became slightly obsessed with seeing a wild dog (never got to, womp), but hyenas seemed like they were in the same family, so I fell in love. They're scavengers and known for being kind of gross garbage eaters, but I love them! They're so badass! Their teeth crush bone because they're really into bone marrow (#guthealth) and, interestingly, their poop is bright white from all the marrow they eat. One morning, we went lion tracking. We had different guides for this - from Ol Pejeta directly - and they were fantastic. So there are a few lions who are collared in the conservancy. 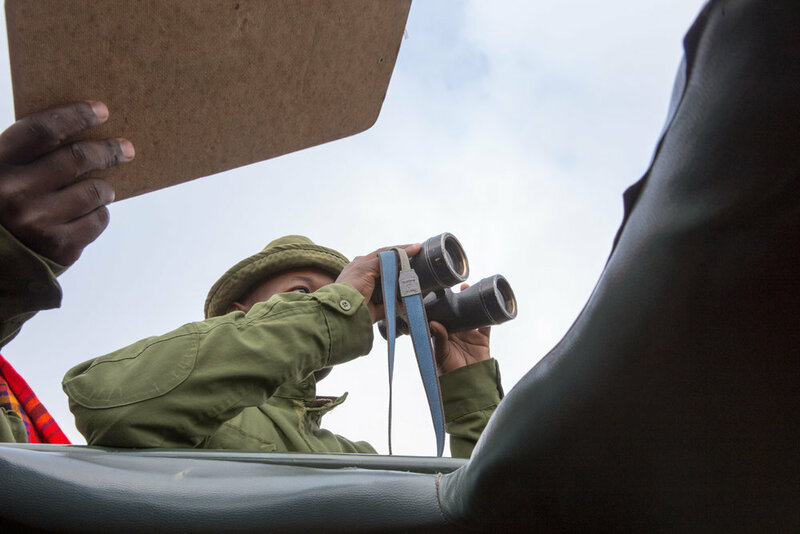 This allows Ol Pejeta to track their movement, behaviors, and the population. Initially, I wasn't a fan of hearing that some of the animals are collared, but the guides put the animals first. We stayed only fifteen minutes or so after we found the lions, because they didn't want them to be disturbed. We also helped with their research by filling out the paperwork for the Ol Pejeta staff. We marked down who the tracked lion was with (two brothers), what they were doing (laying around), and how they appeared (she seemed to have a minor injury - a limp - which we called in and subsequently passed the scientist who was on his way out to check it out). this guy was under my cabin one afternoon just hanging out! Our group also had the incredible opportunity to meet Sudan, the last male northern white rhino in the world. You can read a little more about it here. We went for sun downers most of the evenings, which is where you grab a drink and a snack and head out to the bush to watch the sun go down. 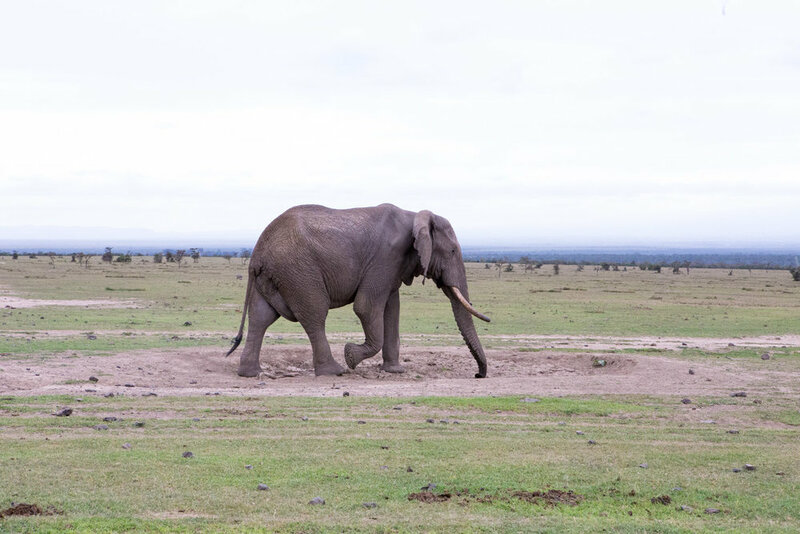 I couldn't believe it when this elephant walked right in front of the peak of Mt Kenya. Speaking of Mt Kenya, it's the second highest mountain in Kenya after Kilimanjaro. I'm putting it out there right now - I want to climb Mt Kenya one day. There, I said it. Bucket list item. Elephant in front of Mt Kenya. Just look how gorgeous it is from the plains?! Apparently it takes about three or four days up and one day down with a guide. I guess that means I'm going back at some point. It was a truly incredible week in Kenya, and I definitely would like to go back sometime and hold another yoga retreat there. Stay tuned and thanks for virtually joining along! You can find all upcoming yoga retreat information here if you'd like to join us in the future.